I purchased a Mac Mini 2018 and connected it to my Dell 42" monitor via HDMI. I works fine except that the screen goes black intermittently and comes back after 3 or 5 seconds. The monitor and cable works well with other computers. I also checked the connection and upgraded the OS to the latest one. Nothing helps. I unplugged the HDMI cable and plugged it into USB-C using an adapter. It has no problem. So I guess the HDMI port has an issue. I don't have the exact same problem, but the HDMI port does seem to behave a little oddly; the signal doesn't appear to be 100% perfect - during boot, wakeup, or after display mode changes, some of my displays will briefly show a distorted image. Either the colours are off, the image is shifted, the image is briefly simply noise, etc. but it seems to settle down OK after a few seconds on the displays I have and so far has not recurred once the image has "settled in". I do have one screen (Acer XR341CK, 3440x1440 75Hz) which is detected but shows no image at all when connected via HDMI 2.0 and native resolution is selected (lower refresh rate or resolution works). 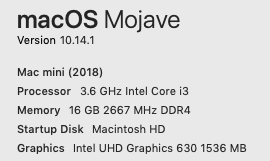 (It is not detected at all by the 2018 Mac Mini when connected via a USB-C to DisplayPort cable, suggesting the GPU in this Mac somehow doesn't like this display.) The same display works as expected on other Macs and indeed when connected to an eGPU on this Mac Mini. The USB-C to HDMI cable is a fine solution if the above mode restrictions are OK for your display; otherwise, if your display has a DisplayPort input, I recommend trying a USB-C to DisplayPort cable. Apart from that Acer display, this is working fine on all other displays I've tried too, including those that have shown the brief image corruption I mentioned via HDMI. Actually you may have run into something I have run into from time to time with Apple hardware: seemingly good hardware fails or fails intermittently on Apple hardware. I have chalked it up variously to "Apple's high standards," "not completely compatible," "why, Apple, just why?!" It is most likely just what you have found out, a completely good HDMI cable. And another "completely good HDMI cable" may have similar results, fail completely, or work perfectly. Me, I'd buy another cable (different brand, with a good return policy) and give that one a try. It could be a problem with the cable or the port on the Mac. But unless it's a really cheap HDMI cable that you can blame on crappy manufacturing in (insert country of choice here) it is merely an inexplicable incompatibility that you may never know the cause of. Not the answer you're looking for? Browse other questions tagged mac display mac-mini hdmi .